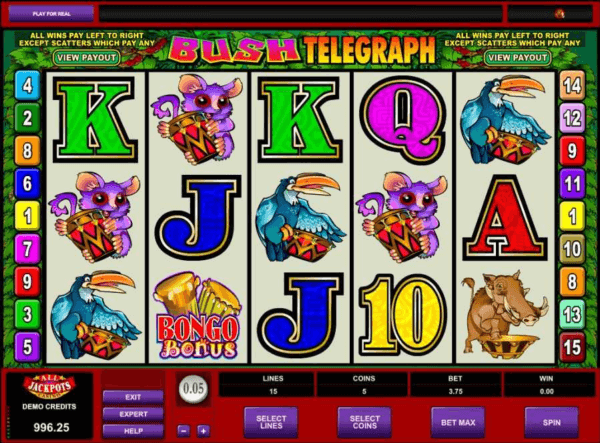 Bush Telegraph is Microgaming video pokies game where you find mysterious and dangerous jungles full of life in this 5 reels and 15 paylines pokies. You will learn here how people communicate in jungles by using drums specially the animal inhabitants of jungles. You can play for free or with real money at online casinos powered by Microgaming. There are three bonus rounds, which make the gameplay much more interesting and rewarding. The jackpot of this Microgaming pokies game is 7 500 coins. 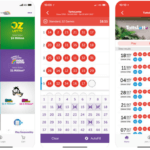 The reels of this online game are filled with symbols of the bongo drum, the seedpod, the Wild icon, the toucan, the bush baby and the African wild pig warthog. There are also A, K, Q, J and 10 card symbols. Wild symbol here is the icon with the word ‘Wild’, which substitutes for all non-special symbols and also has functions of the jackpot symbol. The Red Seedpod is the Scatter symbol and the key to the free spins bonus. In addition to Seedpods Scatter wins, you can play 10 free spins with the 3x multiplier. There is also a bonus feature and its bonus is called the Bongo Bonus. You will have to get at least three Bongo Drum Bonus symbols to activate it. There your task will be to click on three drums to get your coin prizes. Also there is a Gamble feature, where you can double all your wins. 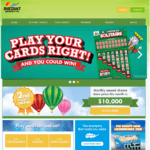 Cast for Cash scratchies is so much fun and easy to play and if they are to be played instantly without any download. 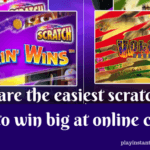 PlayInstantScratchies.com © 2007 - 2019. 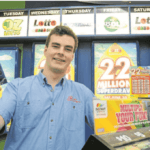 You must be 18 years old to play scratchies online for real money. 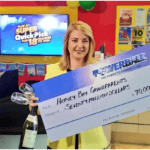 Is Gambling a problem?